In the morning panoramic tour of India's capital Delhi having fascinating history. Old Delhi or the ancient city of the Mughal sultans with steep, straight streets teeming with people and New Delhi, the capital of the India with wide avenues suitable for a garden city. Visit the Raj Ghat, the site where Mahatma Gandhi was cremated; Jama Masjid, the largest mosque in India; visit the Red Fort which was once the most opulent fort and palace of the Mughal empire and the bustling shopping centr of Chandi Chowk. Then visit New Delhi Qutb Minar minaret, the tallest minaret in the world. Finally Connaught Circus, the heart of public life in New Delhi, Rajpath and India Gate, Parliament and President House. Overnight at hotel. Morning drive to Mandawa, a small feudal principality. Through a string of villages close enough to each other and forming a unity, Shekhawati is a museum of paintings open in Rajasthan. He was the favorite place of the Marwari community, great merchant families of India from the 17th to the 19th century. Then thanks to trade with the English East India Company, these wealthy merchants did build lavish mansions, havelis decorated exterior and interior frescoes. Mandawa is a village with winding streets that intersect men and animals in total harmony. Stroll through this lively village where camels are king. Overnight at hotel. Day exploring the many havelis surrounding villages Fatehpur near a small town of Mandawa founded in the 15th century and former capital of a small Muslim state which preserves some of the most beautiful havelis in the region. Nawalgarh, founded in 1737 has dozens of havelis and it is a pleasure to walk through its streets. Jhunjhunu, Dunlod, Alsisar are also part of the towns in which to be. These walks give a good impression of rural life in this region of Rajasthan. Overnight at hotel. Departure by road to Bikaner famous for its camel farms. Crossed by caravans from the Far East and Arabia, this desert city, known as the Red City, was founded in 1488 It still benefit from the arid climate that surrounds it as protection against his enemies, but the old town however defended by impressive fortifications. Away from the walls, the latter contains a maze of alleys where circulating carts pulled by camels, a bustling bazaar and some havelis. Visit the Junagarh Fort, built in the 16th century palace that houses beautifully decorated. Then walk through town over these streets. Continue to Gajner. Overnight at hotel. Located about 50 km from Jaisalmer, Khuri is one of many small villages in the desert of Thar and surrounded by dunes. Homes are built in the form of traditional round huts of mud with their thatched roof and painted white washed walls. Some are painted with ocher and red patterns. Here, rural life is pervasive and the gathering point of the village is the well where women come to draw water and talk about the latest events, while the children play and run. This peaceful village of unique charm with its narrow streets, courtyards open is a haven of peace and quiet. 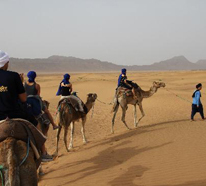 People come for the atmosphere in Khuri desert, dinners under the stars and rides a camel in the spectacular desert. Overnight at hotel. Road in the morning to Luni, located near the city of Jodhpur. Luni is a charming little village that reflects the royal past of Rajasthan. The village craftsmen, cabinet makers, blacksmiths and potters, still working ancestral way. The village, a quiet and peaceful place, houses the Fort Chanwa built of pink stone, an example of the elegance of the architecture of the last century. Tastefully restored, it welcomes visitors for a relaxing time. Overnight at hotel. Morning drive to Ranakpur. It contains one of the most beautiful Jain temples throughout India, Adinath Temple. It dates from the 15th century and sculptures reminiscent of fine lace. Complex figures represent mythological scenes on the pillars, walls and domes. The entire monastic now houses a small community of Jain monks that many pilgrims visit. Overnight at hotel. After breakfast, drive to Bijaipur. The city deserves closer attention because of its historical significance. Several large and famous Indian dynasties ruled Bijaipur and its surroundings. Its location made it a strategic base during the wars between Rajputs and Mughal. It is now a quiet, picturesque little town off the beaten path. Its castle, which dates from the 16th century, is now a boutique hotel opened to tourists. Nearby, you can enjoy a wide variety of wildlife and many species of birds. Overnight at hotel. Morning drive to Bundi, a city so old that it seems to see her emerge from a history book. The town of Bundi is nestled in a narrow valley surrounded by huge fortified walls. The fort, built in 1534, is accessible by an impressive gateway. The view of the city and surrounding area, from Bhim Burj, the imposing ramparts, is magical. We reached the palace of Bundi by a paved ramp. Only one party, the Chittra Mahal, is open to the public. 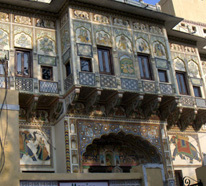 It is a fascinating pavilion contains a gallery of murals in the turquoise and green hues that adorn the palace. His paintings of great finesse, depict moments of life of Lord Krishna and illustrate the hours of court life. Overnight at hotel. Departure to Samode. Large town nestled in a valley, the feudal stronghold of Samode was built there more than four centuries. Samode Palace is a luxurious built among hills retirement. It is a haven of peace amidst beautiful gardens, spacious bungalows surrounded by fountains. It has perfectly preserved frescoes and a quaint atmosphere of incomparable charm. A walking tour in the village to meet its artisans is highly recommended. Overnight at hotel. Morning drive to Amber and splendid fort atop a rocky outcrop. Amber was the capital of Rajasthan before being dethroned by Jaipur in 1727 . This ancient fortress is acccessible on elephant back or jeep. Visit multiple mansions contained in the box. The magnificence of this fort demonstrates the power and pound capacities of Rajput princes at that time. Return to Jaipur for a ride by cyclo in the old town full of colorful markets and bazaars. A special atmosphere reign in its ancient streets. Later in the afternoon, drive to Delhi and transfer to Delhi International Airport for the flight back. Courteous in this former British fighter situated beside a lake. Huge rooms with functional bathrooms. Beautiful shady garden in which to relax. Excellent service at a restaurant by the lake. A plus for those who want the authenticity of the desert an hour from Jaisalmer. Beautiful surroundings and a warm welcome. Dinner under the stars is fantastic and a wonderful ride on a camel's back at sunset. Helpful and friendly staff. This ancient fort of Maharaja turned hotel is a total success, everything is authentic. The spacious rooms are furnished with period furniture. The gardens are gorgeous and very well maintained and the pool is significant in fine weather. Very nice stop during a tour to Rajasthan. Located in a beautiful setting surrounded by the forests of the mountains Aravelli. Great comfortable bungalows and simply decorated with a large terrace overlooking the countryside. Step relaxing in a rural setting. A strong harmonious 16th century palace converted into a hundred years later, that looks good surrounded by extensive green spaces. Warm welcome, excellent comfort. Swimming Pool. Authentic hotel in the city center. Spacious rooms, old world décor with lots of charm. Pleasant and helpful staff. Beautiful roof terrace.